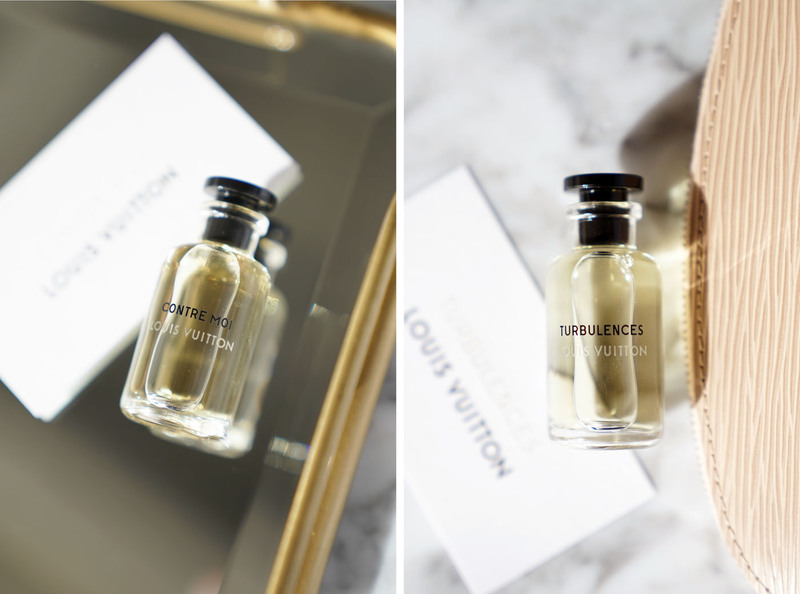 Last fall Louis Vuitton launched perfume consisting of 7 scents in their Les Parfums line. I happened to be browsing the beauty department at Saks Fifth Avenue in Beverly Hills the day they launched in stores and was able to test all seven in person. The rep who helped me was absolutely charming and friendly. I loved that he was patient and took the time to explain each scent carefully and I was especially appreciative of the fact that there was no pressure to make a purchase even though he took a considerable amount of time assisting me with exploring the new launch. There was a specific order in which he sampled and spritzed them on the cards. He explained that there was a “fragrance journey” and each scent had special meaning. We started with the lightest scent Rose des Vents and ended with a sampling of Mille Feux. After getting a little background on each one, the rep then asked me to pick my top two to spray one on each arm. I fell in love with three of them and since the individual bottles are quite expensive I decided to purchase the Miniature Set ($290 for 7 scents, 10 ml each) so I could try and enjoy each one. The scents are each unique and distinct with a luxurious, refined and sophisticated and classic feel. 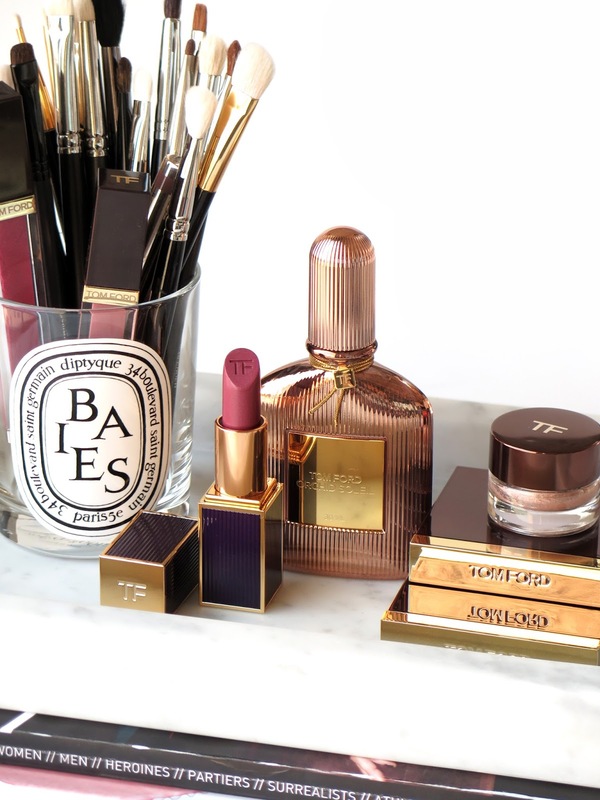 Anytime I wear one I can’t help but feel like a more put together version of myself – the scents lift the mood and add a touch of luxury without being too strong of feeling overdone. I think the packaging and presentation is absolutely exquisite! The miniatures in the set come boxed in a beautiful white and gold round box, each bottle comes with a removable stopper. The minis do not have spritzers and I wish they did as it makes application so much easier. The bottles however are well designed with a sturdy cap to keep the lids tightly sealed but are still easy to remove with a bit of maneuvering. A quick look at the miniature size compared to some other items for scale including the Replica Filter in Glow (50 ml), Chanel No 5 L’Eau (50 ml), Jo Malone Mini (9 ml), Chanel Le Vernis and Tom Ford Lipstick. At the time I bought the set the store did not yet have a tester of the miniatures so I did not know they didn’t come with spritzers. The store reps hadn’t seen it in person yet either as the box it comes in (which is a white box shown in the very top photo) is sealed with a clear plastic wrap. After purchasing it, I opened it in the store so we could all see the size and how the minis were bottled (without spritzers). Apogee has a light spring time vibe with lily of the valley, jasmine and rose. This was in my top three picks with a light fresh and slightly green everyday kind of feel. Notes include Lily-of-the-valley, jasmine from Grasse, magnolia from China, gaiac wood, sandalwood essence. I cannot detect any wood or sandalwood notes with my nose, but having smelled other lily-of-the-valley scents it makes sense that they are there since this one has a less powdery or floral feel that most lily-of-the-valley fragrances have. Rose des Vents is a petal rose with a mix of several different rose notes. It’s a sweet and light kind of scent like a sweet garden. There is a very soft and slightly fruity feel to it making it different from most rose scents. Notes include centifolia rose absolute, Turkish rose essence, Bulgarian rose essence, Florentine iris, Virginia cedar. This is very light and feminine. Contre Moi has a vanilla-ish vibe but not the traditional sweet kind of vanilla scent. The orange blossom notes and magnolia give it an interesting twist. It has a unisex vibe Notes include infusion and essence of vanilla from Madagascar, Tahitensis vanilla, orange blossom, rose centifolia from Grasse, essence of magnolia, ambrette seeds. Turbulences is one of the ones I did not care for as it smells almost dated with an aged dusty kind of feel. It smells of tuberose with leathery notes. include tuberose, jasmin grandiflorum from Grasse, absolute of jasmine sambac from China, may rose. Mille Feux notes include leather infusion, raspberry, osmanthus from China, iris from concrete, saffron. This is in my top three – it has a sweet kind of feel without being overly sweet or fruity. Dans La Peau is a scent described as skin-like. This was also in my top three. It is a difficult one for me to describe but it smells very clean with a mix of floral notes, leather and a slight hint of apricot. It has a raw and earthy feel in the sense it is very natural. Notes include infusion of natural leather, Jasmine from Grasse, absolute of narcissus, musk, Magnolia from China. Matiere Noire is a darker evening type of scent with blackcurrant and white narcissus. It has a deeper more complex feel compared to other blackcurrant scents like L’Artisan Mure et Musc or Diptyque L’Ombre Dans L’eau. With Matiere Noire I smell blackcurrant, musk and patchouli the most. Notes include Laos agarwod, Sambac jasmine, narcissus, rose centifolia, cyclamen, patchouli and incense. I think this one could pass as a unisex kind of scent. There are several different ways to purchase the scents. Individually they come in a 100 ml size for $240 and 200 ml spray for $350. There are also travel sized sets with four 7.5 ml cartridges and a travel bottle with magnetic closure for $240. I fell in love with the Miniature Set because it allows me to sample each one. Also as I already own a lot of perfumes and it takes me forever to use one up the minis were the way to go. I’ve been playing with these for several months now and while I’ve found three that I really like although due the high price I haven’t felt compelled to buy the full size in any particular option. 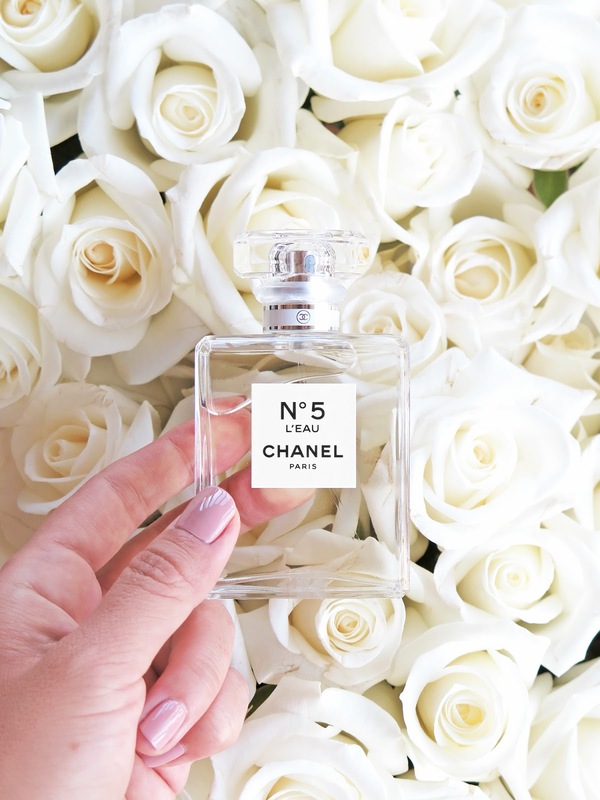 On me the strength of each scent is just perfect – not too strong but still strong enough to last all day without fading. A few dabs on the wrist is all I need. I do wish the Miniature Set had spritzers on the top for easier application like the full size bottles which are just absolutely beautiful in design, but I have no regrets splurging on the minis. My top favorites are Apogee, Dans la Peau and Mille Feux. You can find Louis Vuitton Perfumes in stores and online. If you are able to visit a store I highly recommend you give them a try in person! The Miniature Set retails for $290.